BMW owners, who have filed a criminal suit against the German luxury carmaker over fire-prone vehicles, on Thursday urged authorities to conduct simulations and stress tests on models subject for recall, citing their psychological damage and the need for an acceptable explanation. They also downplayed recent speculations by some experts that the fires may be caused by software manipulation, instead stressing they believe the problem lies with a defective exhaust gas recirculation module. Speaking on behalf of owners at a press conference in Seoul, lawyer Ha Jong-sun representing the case claimed BMW had designed the EGR to operate excessively in order to meet stricter Euro 6 emissions standards, ultimately leading to engine fires. 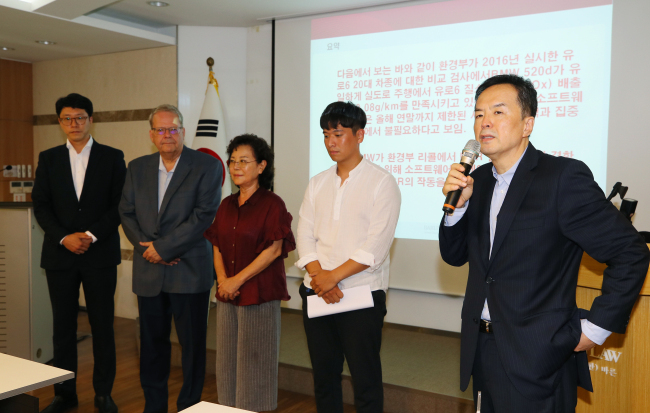 “We request the following five tests to Prime Minister Lee Nak-yeon and Transport Minister Kim Hyun-mee,” said Lee Gwang-duk, whose own 520d experienced an engine fire, as a representative of the victims. The owners asked for stress tests be conducted on the 520d and simulation tests to be conducted on a parked 120d with the air conditioning at full blast. They also requested to send a burnt BMW car to the US National Transportation Safety Board for analysis on the cause of the fire; to bring in a used 520d sedan from Europe to inspect whether it is equipped with the same EGR module as those sold here; and to reveal information on tests and future plans related to the investigation. Twenty-five BMW owners -- those who experienced engine fires and owners of vehicles subject to the recall -- filed criminal suits against six BMW officials last week, emphasizing the need for authorities to step in to secure emails exchanged between the BMW headquarters and EGR maker, a Korean auto parts supplier, as BMW cars produced after November 2016 contain the altered EGR valve. Later in the week, a BMW owner whose car caught fire while driving and 19 other BMW owners are to file criminal charges against two officials at the BMW headquarters and an executive of BMW Korea. During the press conference, Ha said it would be unnecessary to look into whether the carmaker had manipulated software, as the Environment Ministry has already confirmed no manipulation of the exhaust gas software in 2016 upon the Volkswagen crisis, and in consideration that issues related to software are confidential and cannot be verified unless voluntarily offered. He instead raised the speculation that BMW may have designed the EGR to operate at a higher capacity compared to other manufacturers in order to meet the exhaust gas regulations without manipulation, which could have led to perforations in relevant parts and eventually fires. Some skeptics have suggested the possibility that BMW may have manipulated the electronic control unit software to reduce exhaust, which, if proven to be true, would widen the range of concerned models and potentially lead to legal charges against BMW. With questions left answered, such as why BMW cars are catching fire more frequently in Korea than elsewhere, the mystery surrounding the BMW fires continues to deepen, with 31 BMW cars catching fire this year so far. Kim added that BMW has yet to submit data on engine fires in other countries to back up its figure on the 0.12 percent failure rate of BMW vehicles here and 0.1 percent elsewhere. Meanwhile, as of Thursday, some 91,000 units out of 106,317 BMW cars subject for recall have completed safety checks, and about 9,700 additional units are registered for inspection, BMW Korea said. The company said it had sent out text messages and made phone calls to 5,000 BMW owners whose vehicles have not yet received emergency checks.